Particle & Surface Sciences introduces the NS200 nanoparticle characterisation system, the latest nanoparticle product from NanoSight UK. PsS is the sole distributor of the NanoSight range of products throughout Australia and New Zealand. 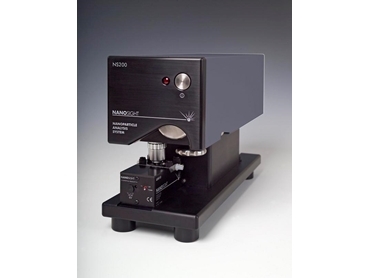 The NS200 nanoparticle characterisation system will be exhibited for the first time at the renowned US Pittsburgh Conference and Exposition being held in 2011 in Atlanta, Georgia from March 14th until 17th. Based on the well-adopted LM20 model applying their unique particle-by-particle visualisation and counting method, Nanoparticle Tracking Analysis or NTA, NanoSight has developed a user-friendly instrument with a high sensitivity camera built into the housing of the system. Featuring optimised locators that facilitate easy positioning of the measurement cell and with an electronic readout of the cell test temperature, NanoSight’s nanoparticle characterisation system meets the growing need for instruments with a recognised standard operating procedure (SOP). NanoSight’s NS200 nanoparticle characterisation system finds application in diverse environments from life sciences through materials sciences with over 300 systems installed worldwide for the study of nanoparticles. Particle & Surface Sciences also offers a wide-ranging programme of support solutions including installation and service of all instruments by factory-trained technicians, an analytical laboratory as well as a sales department to assist with enquiries.